Gaston Bouthoul, even though he is the inventor of the neologism «Polemology», founder of the French Institute of Polemology, pioneer of sociology of war and a very talented researcher for the high scientifical divulgation, is a little-known and rarely studied sociologist. He points their work towards the alleged causes of wars, understanding war as another social phenomenon. Due to its cyclical or periodical nature, the war-phenomenon approaches the biological processes. The publication of two journals – «Guerres et paix» and «Études polémologiques» –, several treatises and essays on the sociology of war and the development of an international network of contributors helped, no doubt, to the scientific institutionalization of polemology. The Bouthoul’s polemological paradigm eclipses after 1980, coinciding with the sociologist’s death. that over time impact on its specific object of study: war. In this article, Bouthoul reflects on the advent of nuclear threat: its impact on the characteristics of armed conflicts as well as their causes and justification, from the political and collective psychology perspective and the ideological point of view. The historical work of Galli della Loggia is part of the great tradition of European conservative realism, from Machiavelli and Hobbes to Weber and Pareto. This historiography is based on an idea already made manifest by Nietzsche: that opposed forces cross political life and their clash originates unstable equilibrium through which men temporarily settle their relations. The adoption of this perspective, which denies the idea of progress and a conciliatory vision of history and politics, makes Galli della Loggia’s writings a virtually exceptional presence in contemporary Italian cultural context. 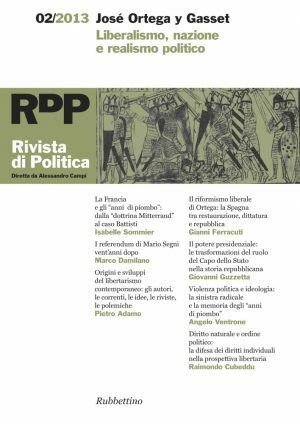 The article focuses on Galli della Loggia’s La morte della patria, one of the most controversial and influential books in contemporary Italian historiography. 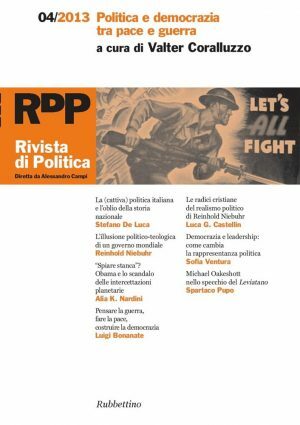 The author examines the principal arguments of the text, starting from the collapse of the Italian State after 8 September 1943 to the shortcomings of antifascist parties and the Resistance. It was precisely because of these shortcomings that the new democratic system, for many years, lacked strength and legitimacy. 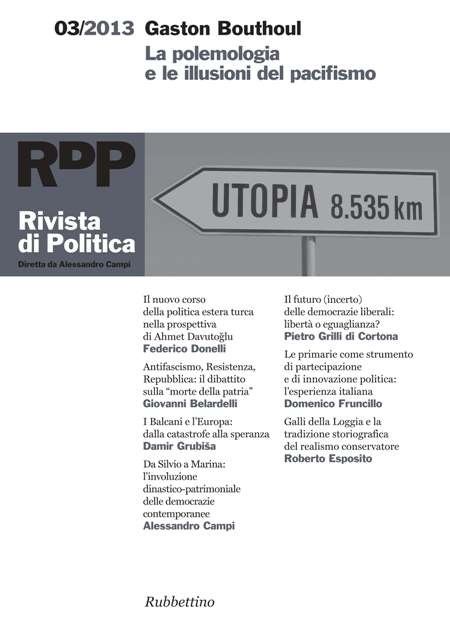 The essay outlines the detachment from the “progressive” culture made by Ernesto Galli della Loggia in the Eighties and Nineties of the last century. The result was a constant reflection on the “Catholic question” in Italy and in the contemporary world. In particular, Galli has focused his research on the relationship between Catholicism and the Italian history, between Catholicism and liberalism, and on the role of religion in the public sphere. 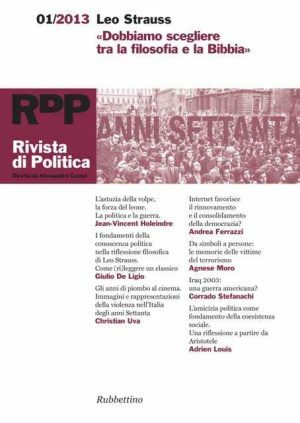 Primary elections have acquired a stable role within the Italian political system and are emblematic of the factors which have contributed to systemic political transformations in this country in recent years. Centre-left political forces frequently use primary elections to identify candidates for monocratic positions at all institutional levels. Within the Centre-right, however, the supporters of primary elections are also on the rise. Growing media attention testifies to the progressive “institutionalisation” of primaries in the Italian political system. This article contributes to ongoing discussions about the consequences of primary elections. Their perceived benefits will be analysed – including competitive advantages for candidates selected via this procedure, increased cohesion within coalitions, greater party legitimization, openings for “new” forms of participation – with a view to assessing whether these have been realised and, if not, whether they have a reasonable chance of being achieved. In the last decade, the AKP-led governments have enlarged Turkish sphere of influence and have make Turkey a pivotal International actor. This is mostly based on the line traced by the current Foreign Minister Davutoğlu in his geopolitical theory known as “Strategic Depth”. This paper analyzes the new course of Turkey’s foreign policy. More specifically, it focuses on two elements of Davutoğlu’s theory; namely the concept of new “geographical imagination” and the controversial, but abused notion of neo-Ottomanism. The practical results of new Turkey’s foreign policy in Africa, a region for a long time ignored, are detailed. The Turkish civil society has played a relevant role in different arenas (economic, education, humanitarian). The complementary action of private and public actors, the absence of a colonial history and the political rhetoric ability of its leaders increase Turkish influence in the region and make it a key player for future macro-regional balances. Damir Grubiša, Europeanization of the Balkans or Balkanization of Europe? Europe is suffering the worst economic crisis of its recent history and it runs the risk of division and fragmentation. The Balkanization is a political perspective: from a historical viewpoint evokes a political destiny made of internal divisions and ethnic conflicts like the Yugoslavia disintegration during the 90’s. The alternative to Balkanization is Europeanization: for the Balkans, and for Europe itself. This alternative needs a continuous effort to enhance the cultural and normative system, as well as the institutional form of political organization, which was the project of the European Union. The paper deals with the conditions of liberty and liberalism in the contemporary democracy. Political freedom is historically an essential prerequisite of democracy and democracy has been anchored to liberalism: in other words we can say that liberalism called for liberty and democracy called for equality. Therefore we said that the task of liberal democratic systems was to combine liberty with equality. Today much has changed: democracy and liberalism are different and far more than they were in the past. The problem becomes even more critical when we consider that democracy is often thought to be irreconcilable with liberalism. Democracy now seems to have characteristics of a democracy without liberalism.